The Evecase Urban Life Water Resistant Travel Camera Messenger Bag is an essential bag for photographers or experienced world travelers. The compact bag fits a camera body, 1-2 standard lenses, and a 10.1-inch tablet securely. Constructed of a fashionable water-resistant material with closed cell foam padding and inserts to protect the camera and accessories. Main Compartment with Adjustable Inserts - Fits Camera body and 1-2 lenses or flash & chargers. 10.1 Tablet / iPad Sleeve (12 x 8.7 x 0.7inches) - Fits most iPad or tablet with up to 10.1 inch screen size. Front Sleeve Pocket - Fits data cables, smartphone, memory card, travel documents or other accessories. 2x Side Pockets - Fits extra batteries, lens filters, lanyards, or other accessories. Back Sleeve Pocket / Luggage Slot - Carry more accessories or unzip the bottom for easy attachment to luggage cart handles. - Fully Water resistant to ensure extra protection from light rain, snow, or other unexpected weather conditions. 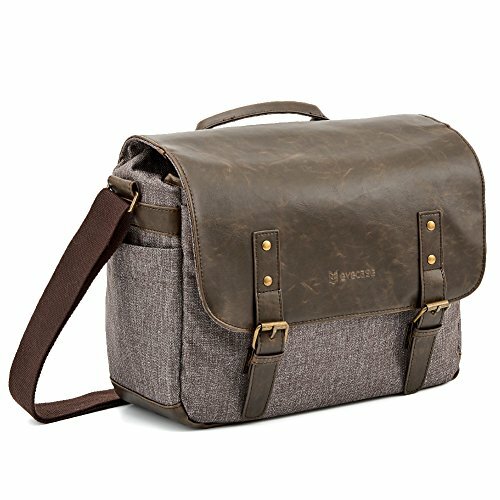 The Evecase Urban Life Camera Digital SLR Shoulder Messenger Bag can fit a camera body,1 - 2 standard lenses, up to 10.1 tablet and other smaller accessories. Interior Size (main): 12 x 8.7 x 4 inches (30.5 x 22 x 10.2 cm). Premium Protection: Constructed of water resistant and durable materials. Fully padded with closed cell dense foam for shock-proof and secure protection. Included foam inserts are adjustable and for customized and secure travel. iPad /Tablet Sleeve: 10.1 tablet sleeve can fits all devices within dimensions: 12 x 8.7 x 0.7inches (30.5 x 22 x 1.8 cm). Easily transfer and sync photos between the camera and tablet while abroad, on trips, or out taking photos.